Moulin Rouge is a fun, vibrant and little bit naughty theme for a party that could work well for any bridal shower, 21st or hens night. Hostess with the Mostess put together this amazing alternative to the French theme on her blog so if your thinking of having a kitchen tea and a hen’s night, why not have a Paris Pink and Black theme for your kitchen tea, and a Moulin Rouge theme for your hen’s night? 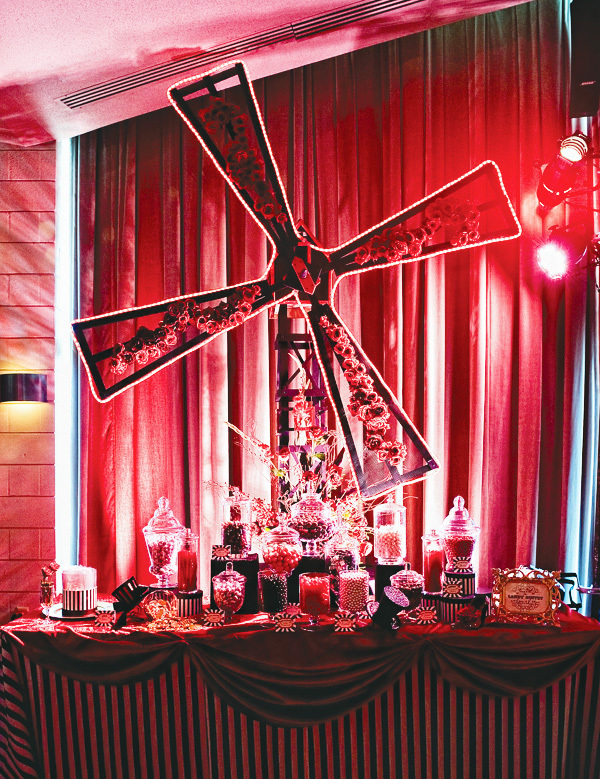 Moulin Rouge is famous for it’s large red neon windmill (which isn’t that big when you see it in person) so Hostess put together a large windmill centerpiece to adorn the candy buffet and bring attention to the sweet sins. 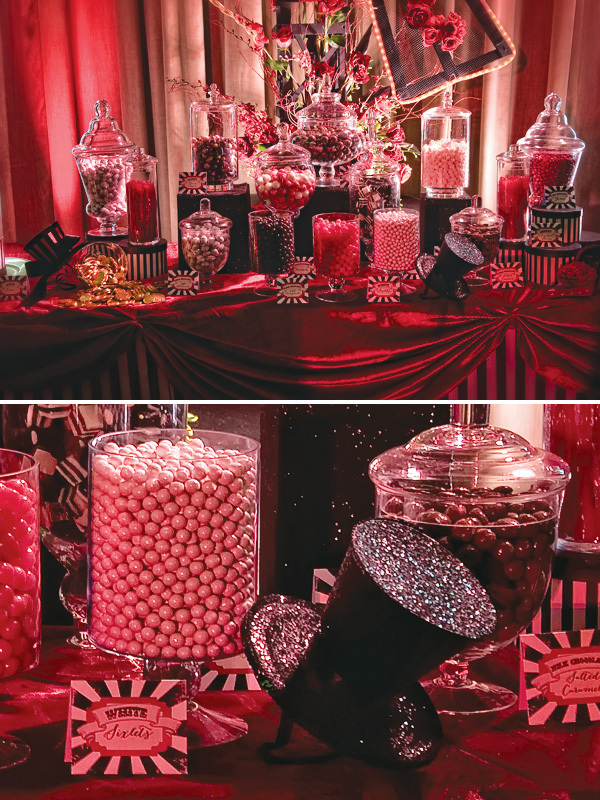 The candy buffet featured a red and black tablecloth with rouffled trimmings and jars of pink, black, white and red candy drenched in red glowing light. A fun and cute idea was to put glittery top hats on the table as decorative attachment on the table to bring out the burlesque theme of the Moulin Rouge. 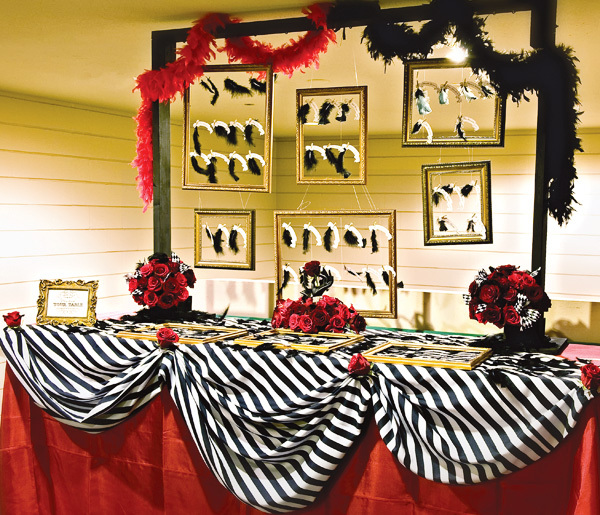 Feather Boas are also a fun way of bringing out the burlesque feel of the Moulin Rouge and different colours that are still in combination with the theme make a fun way to separate tables and buffets. Coming up soon, I will introduce you to the sweet part of your party… Paris black and pink!